YesButNoButYes: Will the real Thriller please stand up? « Here is the virtual news. Will the real Thriller please stand up? Most people are familiar with Michael Jackson's groundbreaking video for the song Thriller. Lately, we've also seen the video in different forms, such as the Thriller in Legos, Thriller in Second Life, and the Bollywood style (although its a different song). But nothing beats a live public recreation! 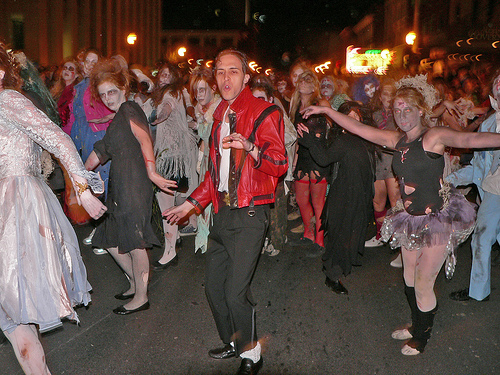 Every October, Mecca Dance Studio and Gallery stages a resurrection of Michael Jackson's "Thriller" video in the streets of downtown Lexington, Kentucky. See a video of last year's performance here, and a Flickr photoset here. This year's event is set for October 22nd. Participation is free and open to the public. However, they would like you attend the rehearsals.